The Energy Information Agency reported that average electricity usage in Pennsylvania was 870 kwH/month in 2011. Using that as a standard consumption rate, I calculated the different types of average costs to a consumer for choosing an ESCO versus the default distributor. First, in 4 out of the 9 distributor regions, it turned out to be cheaper to use an ESCO on average. 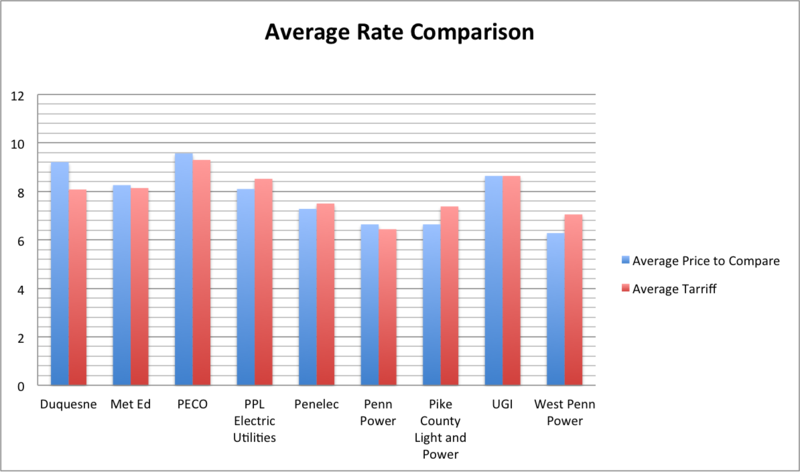 In Duquesne, Met Ed, PECO, and Penn Power regions, the average ESCO price is cheaper than the default distributor. Of course, this is not taking into account nuances in fixed vs. variable plans, renewable generation, and cancellation costs (if any).